Due to all the controversy over conventional cow’s milk, a healthy, alkalizing, inexpensive alternative is almond milk. Almond milk is a low glycemic alternative to rice milk, and doesn’t cause problems with hormone levels like soy milk does and it can be used in place of regular milk in recipes and baking. It is easy to make and has a light taste. Home made fresh raw almond milk contains live enzymes with no additives or preservatives like most processed nut milks. It is a little piece of nutty heaven — sweet, mild, and more gentle on the digestive system than heavily processed milks. It is fantastic to drink, put it on cereals, use in smoothies and shakes, and in cakes. It is important to choose the best quality almonds in order to yield the healthiest richest tasting milk, and it is also very important to soak your almonds in order to neutralize the enzyme inhibitors, activate the nutrient potential, and make them easier to pulverize. Place the raw almonds in a glass bowl or large jar, and cover with filtered water and 1 tsp Celtic sea salt for about 12 hours. 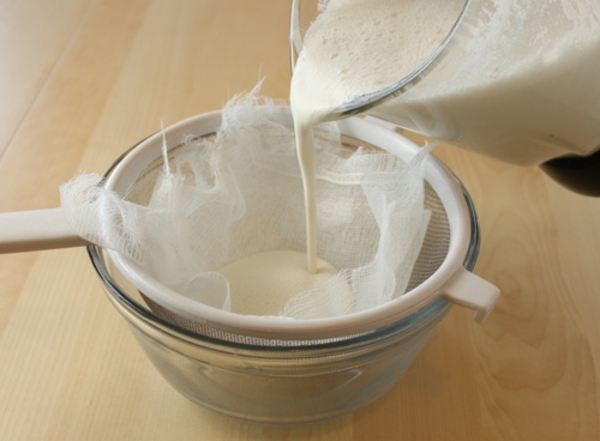 Once soaked, drain and discard the soaking liquid (do not use this to make the milk). Rinse the nuts several times to remove any of the anti-nutrients and enzyme inhibitors. If soaking for the full 12 hours, make sure you rinse and soak a few times. Any nuts that float to the top have probably gone rancid, so discard them to be safe. It is not uncommon to have a few floaters. The almonds will have swelled with water and look a lot more plump. 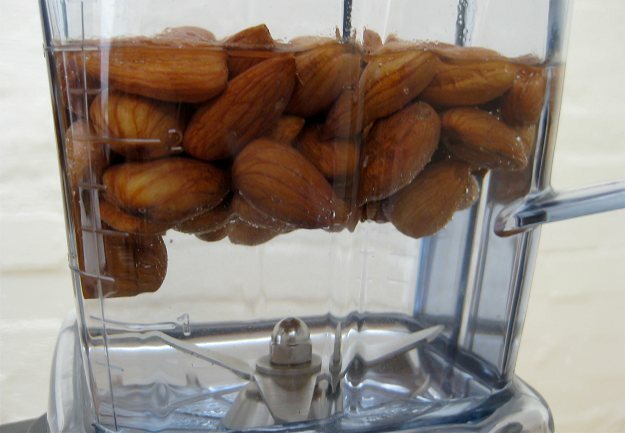 Put almonds and water in your blender and start blending at low speed. Quickly accelerate to high speed until all of the nuts are completely pulverized. You can drink this without straining if you like rustic whole milk. It has more calcium if not strained. But blend thoroughly and then strain if desired. If you would like a smoother, more homogenized-style milk, strain the milk with a nut bag, fine mesh strainer, or fine mesh knee-high hosiery. I must say that a nut bag is the going to yield the smoothest results. You can find these easily from health food stores or from raw online stores. Make sure you wash the bag as soon as you are done so you can reuse again and again. To strain: place a nut bag over the opening of a glass bowl, jar or jug. 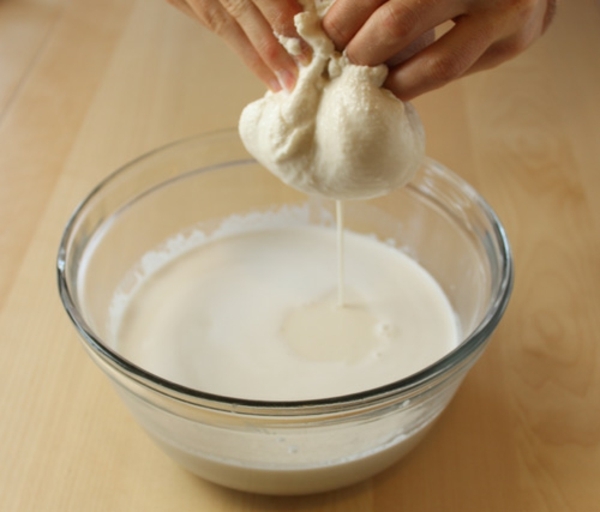 Pour small amounts of almond milk into the bag, and then squeeze it like a cow teet until every last drop is out. Then remove the almond pulp, set aside and keep repeating the process. Make sure you squeeze the cloth to get the last bit of liquid out. This is the creamiest yummiest bit of the milk so don’t miss out on that! Don’t waste the almond meal. Save it and dehydrate it, and then use the almond meal/flour for other recipes such as smoothies, crusts, cookies, nut butter, breadcrumbs etc You can also make a quick, easy body scrub with it. If you would like to drink this milk on it’s own, I have listed some suggestions for sweetening and enhancing the flavor. Jazz this up with whatever floats your almond boat, and you will not be disappointed. Store in a glass jar in the fridge if you are going to keep for later. It will keep for about 2 days, possibly 3 days in a very cold fridge. Read at the bottom of this post for some general tips on home-made nut milks. For Chocolate Almond Milk just add in a couple of tablespoons of raw cocoa powder, 1 tsp vanilla extract, and sweeten to taste. For Cinnamon Milk – add in 1 tsp of ground cinnamon, 1 tsp vanilla, and sweeten to taste. For Strawberry Milk – add in the desired amount of strawberries with the vanilla, and sweeten to taste. You get the drift – the sky is the limit. Get nutty with almonds and you will be in heaven. www.OrganicSolutions1.com = (IBO# 3605911) Check out all our products, we also sell organic weight-loss coffee and coffee infused with Reshi mushroom extract, our Emu oil is incredible, ect… go to my Facebook page to look at pics of what the oil can do, www.facebook.com/revolutioninhealth detox parasites with organic iaso tea, your gonna love it and you will find yourself talking about,… no fee to become a member, when you order your tea, order as a member, then next time you can order from yourself and get a check in the mail. https://www.facebook.com/organicsolutions1 = plz like me! https://www.facebook.com/kathrynzkreationz1/ = plz like me!